Streetsblog editor Gersh Kuntzman will be on NY1 this morning, chatting with Pat Kiernan about the mayor’s handling of the snowstorm last week. Watch for Kuntzman to redirect the conversation towards Hizzoner’s ill-guided expansion of the city’s car fleet, his non-existent crackdown on placard abuse and his waffling on congestion pricing. Also look for Kuntzman to criticize the mayor for his Trumpian attacks on the local press corps. It’ll be a fun seven minutes on Kiernan’s couch! The Daily News editorial board has touched the third rail of New York politics — the third rail. On Sunday, the paper editorialized in favor of a fare hike (tell that to Sweeney!). It’s easy to say the MTA needs our fares to pay for better service. But the paper could have called on Gov. Cuomo to make this vital piece of infrastructure a higher budget priority, or for taxes to be raised on the wealthy — which would be less regressive than trying to balance the MTA budget on the backs of the riders. The real estate industry pushes the idea that regulations are why housing is expensive. Even in the place with the least restrictive zoning and deepest tax subsidy for development in the country: NYC. Advocates for more government intervention in housing push they idea that not enough government intervention is the reason why housing is expensive. Even in the place with the most government intervention in the country: NYC. They are full of it. NYC housing is expensive because the city is already built out at a high density, and adding housing means displacing what is already there — and incorporating the full value of what is already there into the cost of new housing. Not vacant land or some farmer’s field. As explained here — a couple of years before Richard Florida’s book of the same name. Not everyone can live in a handful of cities. Amazon is exacerbating the problem by piling in. What people are seeking here needs to be re-created elsewhere, somehow. But cities require city services, and in the wake of Generation Greed those are going to become more and more difficult to provide. If the city used all its properties to build 100% affordable housing, there would be plenty. Instead it tries to maximize the profit , or worse caters to the parking needs of the NYPD . THAT IS THE CASE AT 11th Avenue and 39 th street where the NYPD insist on keeping a parking lot and thus the housing will cost more . More could be done, and will be. Just about every development site in my neighborhood has been filled in since the mid-1980s. And the Mayor might be going to allow developers to build on Housing Authority parking lots to get some money for the Housing Authority. But when we had lots of abandoned land and buildings, we had the nation’s biggest city funded housing program, from the late 1980s through the 1990s. And at the end of it, we ended up with all those lots off the city’s books (except the “temporary community gardens” which the city was sued to allow their new owners to keep). And yet here we are. Evidence that NYC has “the least restrictive zoning … in the country”? By my eye, building in much of NYC is nearly impossible. Take a look at what happened to the Phipps project in Sunnyside, for example. Re the story on the cost of crappy roads to drivers, how about the fact that it’s worse for folks on bicycles? A pothole cost me a broken clavicle, which now sports metal hardware, and cost the healthcare system several tens of thousands of dollars (I suppose I could have sued the city, but I didn’t bother). Other than Houston. There are very few places in the entire city where you aren’t allowed to turn a house into a multi-family house officially, and even fewer where you can’t get away with it unofficially. Housing below 1 FAR is considered “lower density” here. There you might have 1 parking spot per unit, if you don’t subdivide and waive. Elsewhere in NYC fewer spots are required, though perhaps too many. Elsewhere in the country, more than one spot is often required per new unit. And whereas most jurisdictions impose “impact fees” in exchange for subdivision approval, to cover the added cost of public infrastructure for the new housing, here the new housing is exempted from ALL property taxes in many locations, and its residents just pile into the infrastructure we already have. Discretionary approvals can be contentious here, with Atlantic Yards as an example, but in most cases you can build at high densities as-of-right. We have had a building boom like nothing this city has seen since the early 1960s. And we still have had another housing bubble. The supply issues are local, but the demand is national and global. That’s the problem. On October 7 I had my first fall in 22 years. 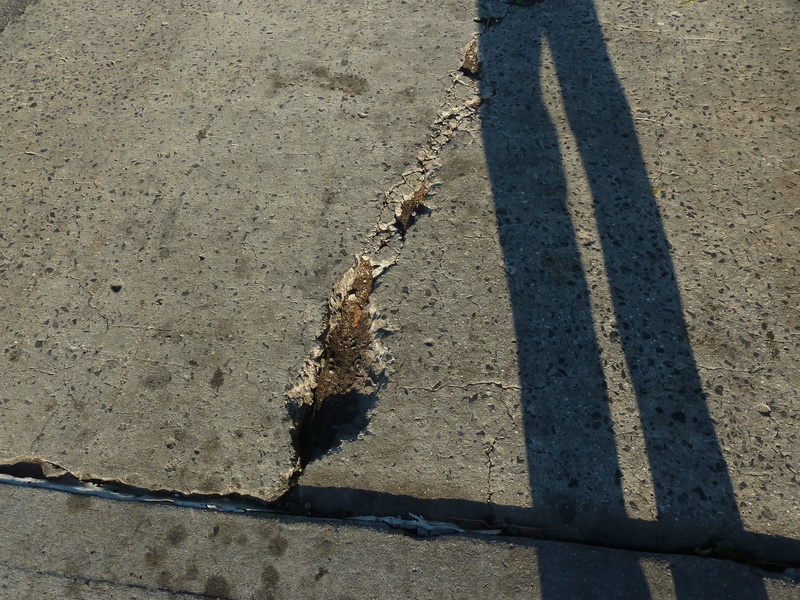 One of the concrete bus stops had a crack which was barely wider than my tire, but about 3 inches deep. With the poor streetlighting I didn’t even see it. It honestly didn’t appear particularly onerous even in broad daylight when I returned to photograph it. I was riding along, and suddenly I was falling. The tire got jammed in the crack. I hurt my left knee and right hand. The bike wasn’t badly damaged. A piece broke off the tire (i.e. 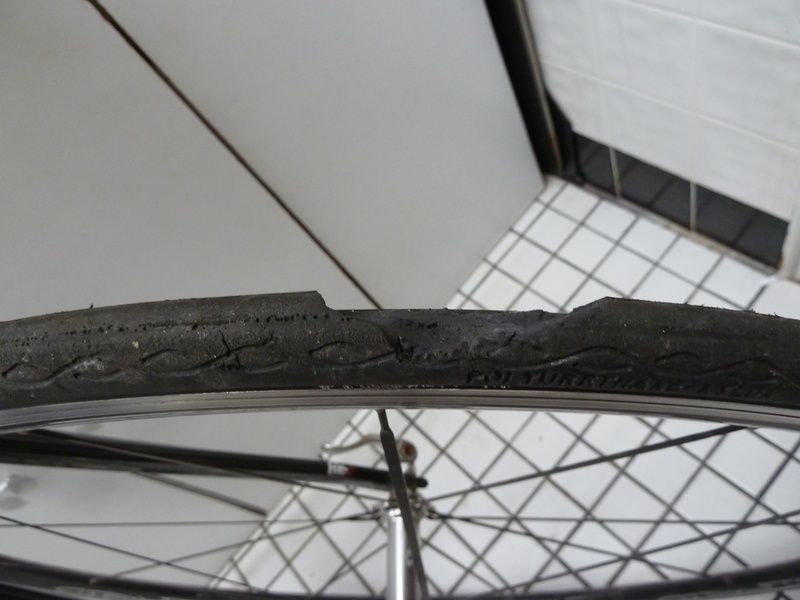 airless tire) but I can fix that. I took pictures of everything. I even contacted Vaccaro & White but never heard back from them. The bottom line is a lot of pavement defects which can send cyclists to the ground aren’t large enough to be easily visible in time to avoid them. 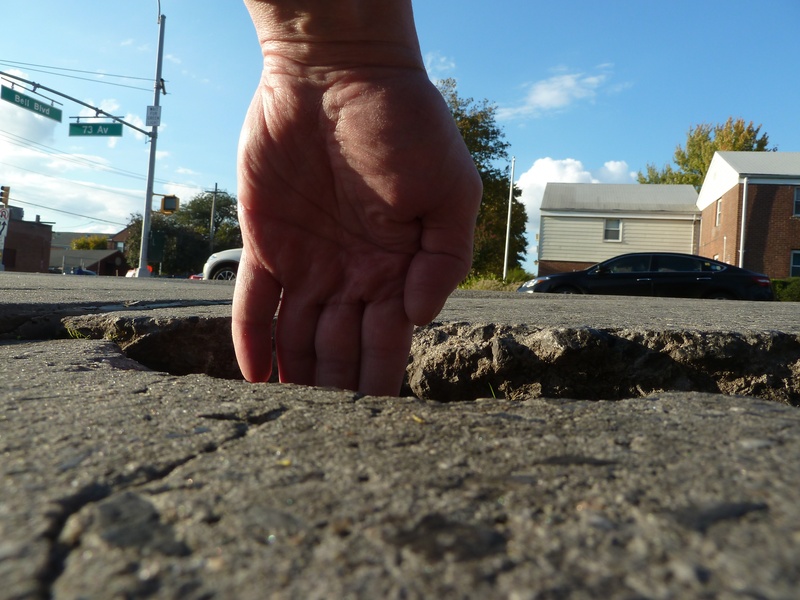 That’s why it’s incumbent upon the city to make sure all pavement is in good repair. The problem with creating more NYCs nationally is the astronomical cost of infrastructure. Our subway and rail system is what enables building to very high densities, while also avoiding permanently grid-locked streets. All of today’s viable cities had their subways and bridges and railroads built with cheap labor in an era where big infrastructure projects cost less than 10% in adjusted dollars what they do now. Unless a way can be found to do this again, we’re basically stuck with the cities we have. Nobody can build a another NYC when subways cost in excess of $1 billion per mile.